But it is this week! It's been Olympic Cycling Week, and I've managed to get to three of the four major road events - the Men's Road Race on Saturday, and the Women's and Men's Time Trials yesterday. And what a wonderful week of sport it's been! The streets and parks have been packed - estimates say over 500,000 were at the Men's race on Saturday, and it must have been similar for the time-trials yesterday. That's half-a-million happy smiling people, of all ages, shapes, sizes and nations, on their feet for hours, shouting encouragement to every competitor, with a special roar for their own favourites of course. My companion on Saturday morning was 85, and she stood there with the rest of us waiting for an hour for the riders to come through. 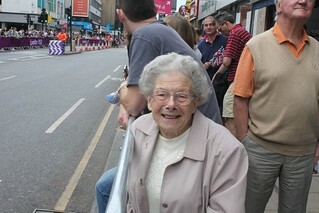 She lives round the corner, and came to watch because it was a historic event, and she thought it would be fun. As she said, "We won't see anything like this again in our lifetimes". Cycle races on the road are always difficult to follow. You only see the cyclists pass once (except for Box Hill on Saturday, which they went up and down seven times because there aren't any mountains in this part of England), and they go by so quickly it's difficult to recognise more than two or three of them, especially in their helmets and wall-to-wall sunglasses. It's impossible to judge how the few seconds you are seeing fit into a day's racing that may last several hours. But it's colourful and it moves, it's human, and it's free. And above all there's admiration for the immense effort and dedication shown by men and women relentlessly pushing their bodies - and their minds - to the limit. 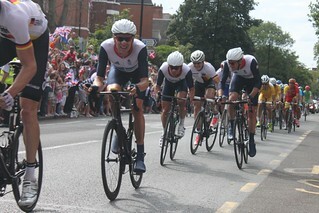 It didn't work out for the British riders in the Men's Road Race. The team of five were set up to shepherd Mark Cavendish, the fastest and most feared sprinter in the world, through to the final half-kilometre, where it was hoped he would be able to unleash his devastating speed and go for gold. However Mark doesn't climb very well - you can't have everything - and when the attacks came on Box Hill his team-mates had to hold back to pace him along. There were repeated attempts to get away; eventually a group of twenty seized their chance and disappeared, and the British riders were unable to close the gap. I was watching the latter part of the race in Putney, 9 or 10km from the end. I didn't realise it at the time, but as I was snapping away I caught a moment with Alexandre Vinokourov of Kazakhstan, the eventual winner, at the head of the leading group, looking over his shoulder to see who's with him, judging when would be the best time to break away. He apparently shot off 500m later, coming out of a sharp turn; only one rider was able to follow him, but Vino had too much power for him in the final metres. But you only find all this out afterwards. By the time the first British riders reached us - Bradley Wiggins, Ian Stannard and Mark Cavendish - they clearly knew they had no chance of catching the leaders. An immense disappointment for Cavendish, but I'm sure he'll bounce back - he always does. But never mind, we all had a great day out at a wonderful sporting event. 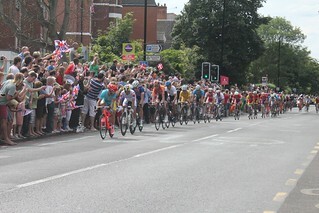 And Bradley Wiggins, of course, was going to be coming back a few days later for the Time Trial . . .
You can see my photos from 8 km from the start (just over Putney Bridge), and from 10km from the end (along Upper Richmond Road). And Bradley Wiggins was kind enough to ride close up to the camera for us, in the morning, and then again in the afternoon (see above). thanks for sharing the experience of being there - watching at home we got to see the race properly but we missed those flashes of being close to those amazing athletes.